Let's fire up the Wayback Machine and head to December 26, 1973, a date that saw the release of one of the most influential and important horror films ever made: The Exorcist. Adapted from William Peter Blatty's 1971 novel, The Exorcist prompted stories of exorcisms to become more and more prevalent following its release. One such story that came to light around that time occurred in Germany, the incidents surrounding a young Bavarian girl named Anneliese Michel. Not long after beginning her first semester at the University of Würzburg in 1973, she began seeing evil visions and hearing demonic voices during her daily prayers, along with suffering violent seizures and convulsions. A neurologist at Würzburg's psychiatric clinic diagnosed her with "Grand Mal" epilepsy, but Anneliese and her devout Catholic family began to suspect her troubles may be of a spiritual nature. The symptoms of Anneliese's "possession" grew much worse as the years progressed, as she began to eat insects, physically and verbally attack her family, urinate on the floor, engage in self-mutilation, and destroy any religious iconography she could get her hands on. After keeping an eye on her for several months, Father Arnold Renz and Pastor Ernst Alt were assigned to perform an exorcism. The duo began the procedure in September 1975, performing at least two sessions a week until the end of the following June, a period during which Anneliese often refused to eat (claiming the demons inside her wouldn't let her). Totally emaciated and suffering from both pneumonia and severe exhaustion, Anneliese tragically died from starvation on July 1, 1976. The two priests and her parents (who truly believed their daughter was possessed) were accused of negligent homicide and found guilty of manslaughter, and the case has gone on to become an oft-cited case in the "science vs. religion" debate. But the discussion has gone on for years. Was Anneliese Michel possessed? Or did she simply suffer from an extremely volatile combination of schizophrenia and epilepsy? Nearly thirty years after the tragic circumstances that ended her life, Anneliese's story was brought to a wider audience with Scott Derrickson's film The Exorcism of Emily Rose. Described by its director as "possibly the first courtroom horror movie," the movie can be also described as an episode of Law & Order centered around the events of The Exorcist, as well as one of the most thought-provoking movies of 2005. Much of the story is told via flashbacks from a courtroom, where hotshot defense lawyer Erin Bruner (Laura Linney) reluctantly agrees to represent Father Richard Moore (Tom Wilkinson) against charges of negligent homicide following an exorcism that went bad. Up against Ethan Thomas (Campbell Scott), a tough-as-nails prosecuting attorney who's more rattlesnake than man in the courtroom, Father Moore refuses to accept any kind of plea agreement despite the archdiocese pressuring him to do so. The padre doesn't care if he goes to jail for a million lifetimes, because his sole desire is to tell the story of what happened. As he tells his tale to his defender throughout the course of the movie, we are introduced to young Emily Rose (Jennifer Carpenter) as she leaves her sheltered rural home to attend college. Things start out well at first, but that's shattered when she has the first in a series of terrifying "incidents," for lack of a better word. She sees bizarre grimaces on the faces of passersby, and much worse, begins suffering from increasingly violent seizures and tremors. Father Moore was called in to exorcize her, and as you can guess from the trial, it wasn't exacly a success. As said trial progresses, Erin finds her cynicism and agnosticism challenged as Father Moore leads her deeper into the horrors faced by Emily Rose before her untimely demise. 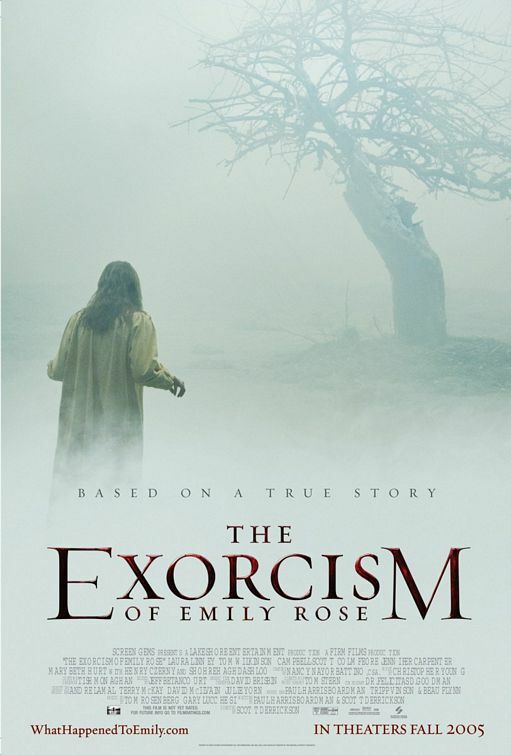 The Exorcism of Emily Rose is one of those movies that has to be experienced to be believed. While the movie was marketed as a horror film, there's really more going on. As I said at the top of the review, the movie is what you'd get if you lumped The Exorcist and Law & Order into a blender, and it's handled quite well. Scott Derrickson (who, coincidentally, also wrote and directed the direct-to-video demon tale Hellraiser: Inferno in 2000) proves himself to be a credible director, especially during the very stylish flashback scenes. The movie has a very creepy leitmotif where the especially tense moments in the flashbacks are bathed in an odd orange/pink light, which I found to be very effective in setting up a necessary atmosphere, an atmosphere enhanced by Christopher Young's amazing score, which is tense, chilling, and wonderfully terrifying. However, I thought Derrickson's direction during the courtroom scenes was almost too simplistic. It was just wide shot, medium shot, and close-up over and over, with maybe a couple of dolly moves across the room to change things up a little bit. I have no problem with simplicity, but it just seemed like he directly avoided doing anything out of the ordinary. On second thought, maybe that was the point. The flashbacks were all about kinetic filmmaking, while the courtroom scenes took a more straightforward approach. But still, the scenes just seemed flat when compared with the rest of the film. Whatever flaws the movie may have, the acting isn't one of them. Jennifer Carpenter is absolutely amazing as the film's title character. Anyone with even the slightest desire to see this movie should check it out just for her. While it seems she has limited screen time, she leaves a lasting presence with her convincing, physical performance. The terrors Emily lived through are never far from the film's surface, and it's a testament to Carpenter's ability. She draws the viewer in with her incredibly vulnerable demeanor, then proceeds to scare the everloving crap out of them. If you can watch the scene where Emily's boyfriend (played by Joshua Close) wakes up in her dorm room without jumping out of your skin, you're a far tougher person than I. Meanwhile, the other main members of the cast are great as well. Tom Wilkinson brought a sense of humanity and well-received depth to the all-important role of Father Moore (despite some cheesy dialogue at times), while Laura Linney is equally engrossing. And let's not forget Campbell Scott, whose turn as an extraordinarily mean prosecutor makes him thoroughly unlikable but still fun to watch. However, I do have a complaint. Chiefly, it's the screenplay, written by Derrickson and Paul Harris Boardman. Take that "the game is on" line during Father Thomas's testimony, for example. I'm sure that line looked good on paper during the writing process, but when Wilkinson says it, it struck me as just being banal and silly. Another, less groan-inducing line wouldn't have been so bad, but they stuck "the game is on" in there and just made me giggle instead. And I did find it odd that Father Moore was the only one on trial. Even if the exorcism failed, Father Moore at least tried to help Emily, which is more than I can say for her parents. They're the ones who agreed to cease feeding her. They're the ones who didn't take her to the hospital and get her hopped up on sedatives so they could not only keep her from hurting herself or others, but so they could get some food in her system. All they did was sit there and watch their daughter die. I'm not saying if Emily was or wasn't possessed, I'm just saying that those two yokels were probably more at fault for their daughter dying than Father Moore was. Call me crazy, but that's just how I see it. I don't want to sound like I'm dogging them because they believed God would cure her of her problems, but I'd like to think God could use science to help out if He wanted to. It's like the old "I sent two boats and a helicopter" joke. In any event, I really don't have any other complaints with the script, so that's enough of that. Though the movie seems to lean more toward the idea of Emily being possessed, it delicately handles both sides of the coin, treating each argument with respect while letting the viewer themselves decide what really happened. Whether you believe Emily (and by proxy, Annaliese Michel) was possessed or if she was a psychotic epileptic, The Exorcism of Emily Rose is a well-crafted movie no matter how you slice it. You can tell a movie's effectiveness by how much you think about it afterwards, and if you get absorbed into The Exorcism of Emily Rose like I did, you'll find it stuck in your brain for a while. I'll give it a solid four stars and a definite thumbs-up.